Last fall, a beekeeper sent me an urgent message letting me know that all of his bees had died, and he suspected his neighbor to be at fault. Where there had been irrigated pasture, there was now cannabis plants. Since the recent legalization of recreational cannabis in Oregon, we’ve been experiencing a “green rush.” If you live in town, you notice a swell in grow shops, greenhouse supply stores, and cannabis dispensaries. If you live in rural areas, you notice “for sale” signs becoming rare, pasture land being cleared, and high tunnels popping up at, what seems, every curve and junction. My first question to the beekeepers was, “what was your Varroa mite (a honey bee disease vector) count?” Nine times out of ten, the response comes back, “I don’t know, they looked fine.” “MmmmHmmmm….there you have it,” lack of good Varroa IPM strikes again. This beekeeper, however, knew his counts. They were low; under five percent. He had treated on a responsible schedule, like he’s done the last five years, and always had healthy, thriving hives. The only thing different was the flower rich pastureland next door was (literally) flipped upside down, and a cannabis operation was in its place. This got me thinking about two very real issues beekeepers could be facing during the current large-scale land use change here in Southern Oregon: increased use of pesticides, and decreased habitat. I contacted the Oregon Department of Agriculture and started a dialogue with Rose Kachadoorian, Pesticide Regulatory Leader & pollinator health expert, and Mike Odenthal, Lead Pesticide Investigator. I tried to get really clear on what rights and protections are available to beekeepers, and also what, if any, pesticides could be causing problems for bees. Like everything else in this world, it’s complicated. Do bees event visit cannabis? Yes. But… It’s not a preferred plant, in most circumstances. However… bees may land on the plant to collect resins on marijuana to make propolis, or they may gather pollen from hemp plants. Can these harm or kill bees? These are mostly essential oils, etc. BUT… Pyrethrins are allowed, and those are a known bee killer. Don’t pesticide rules still apply? Yes. Labels guide growers away from killing bees through direct and residual pesticide poisoning, and “the label is the law.” You can get into BIG trouble by not following the law, and hurting bees. But also… “drift” is not recognized on labels. Rain or a breeze can carry pesticides to near-by habitat, and create real problems for both foraging bees, and ground nesting native bees. Pesticides are only tested on honey bees, so we don’t know the effects on native bees. Only the active ingredients are listed.So who knows what is in the other 98% of what is in that bottle and how it can affect bees. Certain pesticides can interact, and while solo they are on the “nice” list, combined with another one, they get jettisoned to the “naughty” list. Also certain pesticides can “turn on” an otherwise “sleeping” dormant virus and wreak havoc on a bees’ body and immune system. Lastly, habitat! Since cannabis growers don’t need, or want, pollination services, there is no need, or interest, to mitigate bee habitat loss. So - in most cases, the bees are out of food, and the beekeepers are out of honey crop. I’m living proof! The 40 acre irrigated hay pasture (interplanted with bee-loving flowers) adjacent to my teaching and research apiary was converted to cannabis last year, and my honey production dropped 70%!! Are cannabis growers the only offenders to bees in Southern Oregon? Of course not. But this is what this blog is about, so table your finger pointing at other groups for now, and check out our "Farming for Bees" page to see the other initiatives we're working on. So - what can be done? Tell all the cannabis growers to leave? Nope. Scream and yell about it at beekeeper meetings? That happened. Not gonna work. Flip your grower neighbor the bird when you pass in the driveway. Just stop it. 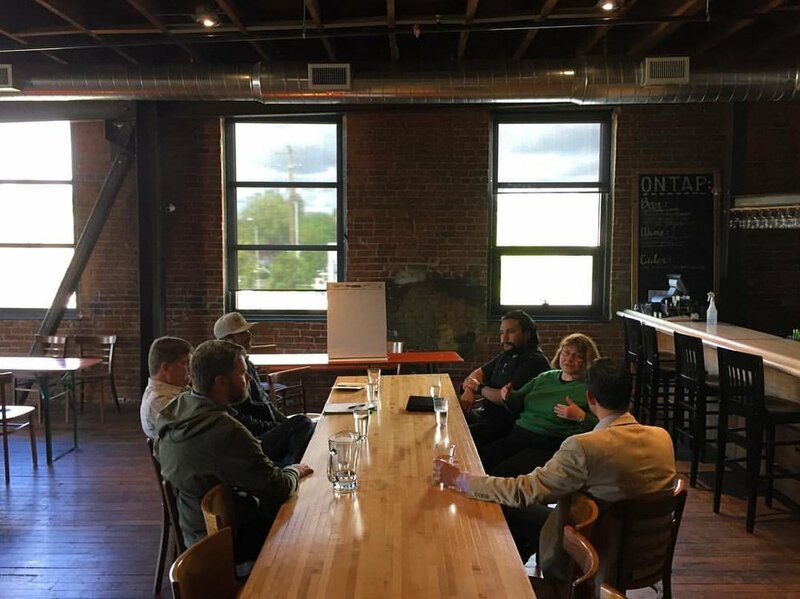 With my Southern Oregon Beekeepers Association “board member hat” on, I began to develop a plan for positive action with local stake holders and the Oregon Department of Agriculture. We planned a symposium for May 12th titled, “Bees and Cannabis: an Educational Symposium.” It was awesome. 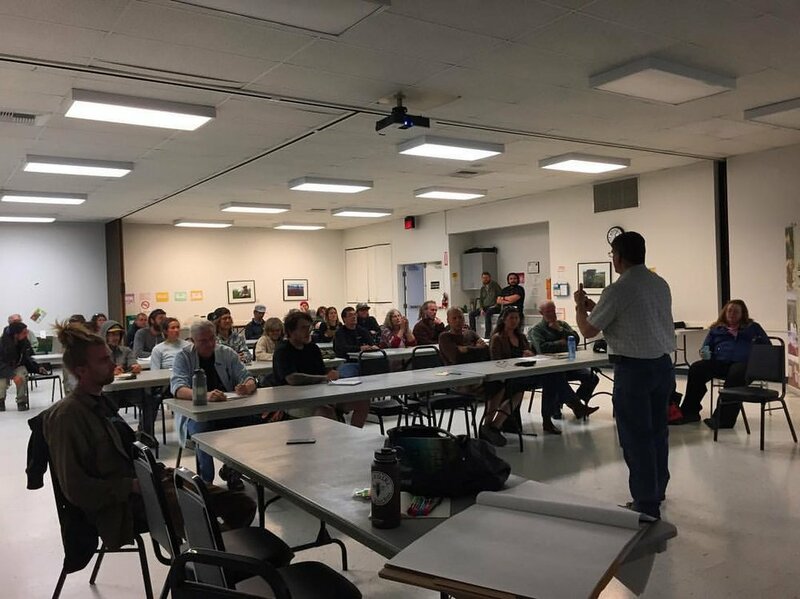 Oregon Department of Agriculture employees, a local county commissioner, pot growers, and beekeepers met for a day of education and developing action items.